Remember the epic French bread post? And all of those amazing Daring Bakers? Well this month's challenge has now come and gone, and I managed to pull it off at the last minute, during our trip to California. The recipe this time was decidedly less involved, and allowed for plenty of adaptations and creativity: Dorie Greenspan's Perfect Party Cake. The host of this month's challenge was Morven, whose blog can be found here. I won't include the entire recipe here, but you should invest in Dorie Greenspan's Baking: From My Home to Yours if you are curious. The original recipe is for a lemon-flavored white layer cake, complete with raspberry filling and a thick, luscious buttercream meringue frosting. We're talking 3-sticks-of-butter-luscious. While this may sound tempting, though, buttercream isn't really my thing....and neither is lemon-flavored cake, for that matter. I knew after reading the recipe a few weeks ago that I wanted to get the creative juices flowing, and make something a bit more in tune with my tastes. Given that we were in the Bay Area for the past week, we made multiple trips to the Ferry Building Farmers' Market, in San Francisco. Trust me, this is really a farmer's farmers' market, and features heaps upon heaps of fresh vegetables, juicy citrus, and handmade breads, cheeses, and jams. We got up early yesterday morning after a 2-day romp in Big Sur to head on over, hoping to find some baking inspiration from the dizzying array of delicious foodstuffs. 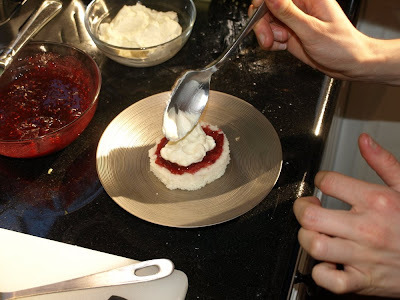 We stumbled upon success at the second stand that we passed, which featured handmade quark. Quark is a mascarpone-like soft cheese, and this particular vendor sold it in a variety of flavors, including the utterly delicious vanilla bean. We tried a sample and promptly bought it, with visions of it oozing from between layers of soft, white cake. A while later we happened upon a sample-happy vendor selling almond brittle which, crunchy with butter and sugar, made an obvious choice for our cake. And so, with quark and brittle in hand, and a jar of raspberry Bonne Maman in the fridge at home, I was ready to go on a baking binge. I stayed true to the cake recipe, although I replaced the lemon extract with vanilla, and baked it in a sheet pan instead of in layers. I opted for a mini cake sandwich instead of a big layer cake; I wasn't sure if I could stretch the quark far enough to frost a whole cake. Besides, I can't resist making miniatures. Once baked, I cut a small circle of cake, and sliced this circle in half to form two layers. 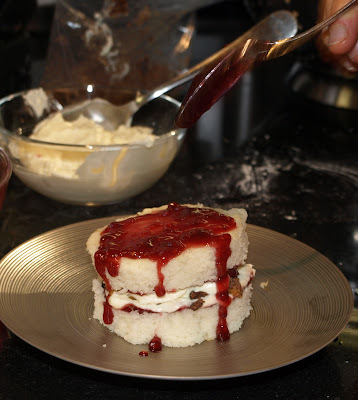 I then spread each layer with thinned raspberry jam. 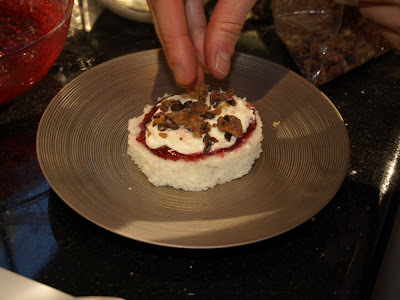 Next came a hefty dollop of quark whipped cream, which I made by (surprise!) 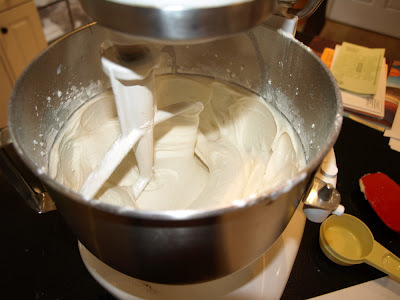 whipping the vanilla bean quark with some heavy cream to get a smooth, spreadable consistency. 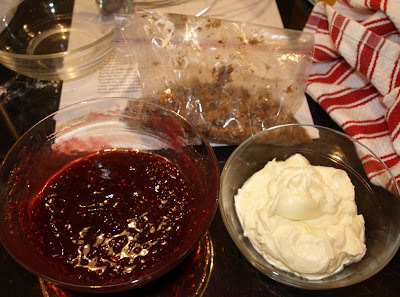 To really push it over the edge, I crumbled up the almond brittle and tossed in a few Scharffen Berger cacao nibs (obtained during a prior Ferry Building visit), and then sprinkled this mixture over the cream. 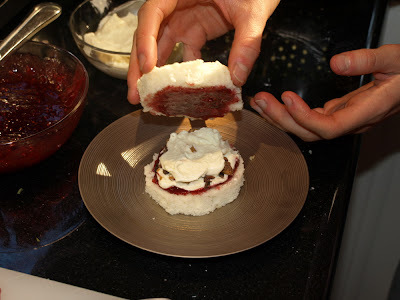 A touch more jam, and voila! 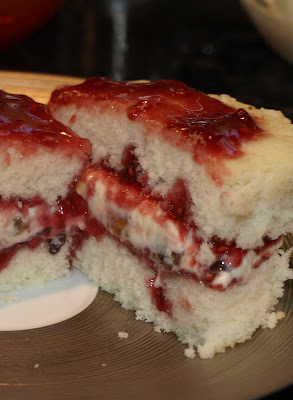 A nutty, nibby, berry-y, creamy cake sandwich. Jonathan certainly enjoyed it, as did I. And in case you were wondering: no, I did not have the patience nor the time to make a whole bunch of these little creations. I cut the rest of the cake into cubes, whipped the rest of the cream and quark, and made a trifle which we gobbled up for dessert later that evening. It was heavenly. So, another challenge down, and I'm anxious to see what next month's challenge is. Thanks to Morven for giving us a little wiggle room in this challenge; I had so much fun picking out flavors and ingredients to make this cake. mmmmm, cake sandwiches. Love it! 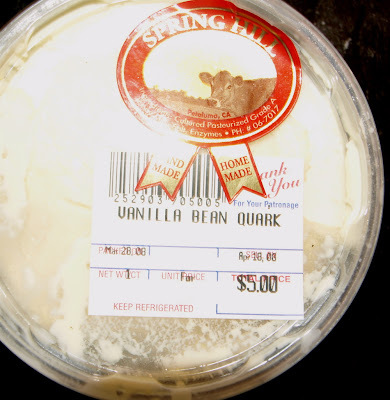 Okay, so now I'm going to pick up a package of that Spring Hill Quark the next time I'm a the farmer's market (luckily they frequent some of our east bay markets too). What a brilliant combination of ingredients you came up with. I love love LOVE the trifle idea. Great job! The best part of this challenge has been to see all of the creative interpretations. Yours was great! 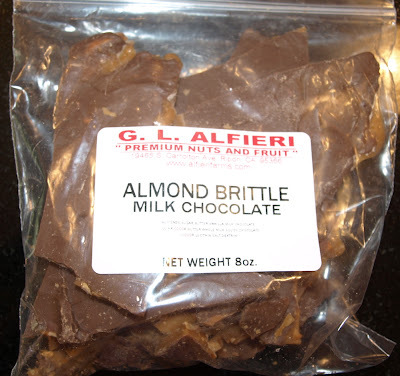 I would love to try the nibs and the brittle! oh my this looks yummy! Wow, vanilla bean quark! Don't you hate people who actually live in proximity to the Ferry Plaza?! Good job on the cake. You did a lovely job on your cake. I'd have love to see a picture of your trifle...it sounds delicious.